I love you. You know I do. The band is set to put out a new release this fall, “World Container”, and this morning, just hours ago, they’ve released the first single on their website, “In View”, along with some pics of Gord Downie. How do bands like this one continue to evolve and write unique material into decade three?! Thanks to all sponsors and organizers, BarCampVan worked. And it was fun. We laughed, we cried, it was better than Cats.Check out the many pics. There’s talk of throwing together a PhotoCamp or DemoCamp in the near future, so keep your eyes peeled at a blog near you! Check out the latest episode of This City Rocks, Canada’s HOTTEST music video podcast…heh. This week we interviewed Vancouver band Panurge – fun dudes, stellar musicians. They’ll be opening for Metric in Victoria next week-end, Sep 3rd. Capo in fine puppy instigator-run-and-hide-semi-bold mode. Ruckle Beach, Saltspring Island, BC. Also starring Meisha the Moo-Moo, Kelly and Moi. Friends of Raincity, the lovely ladies of Lipgloss and Laptops, Airdrie and Kerry Anne, kindly invited me into their studio to sit in while they recorded their 25th epsisode. We had a blast, tested some products (with some before, during and after pics), talked about my job at Raincity, our Raincity Pilot, celebrity crushes, goDaddy, naked pictures, and travelling on airplanes without lipgloss (gasp!). These women have it goin on. The podcast is a weekly health, cosmetics, and beauty podcast for the thinking woman. They’ve tapped into a niche and have scooped up quite a large audience since the show’s inception in March of this year: Newspapers want to talk to them and they get tons of fan mail! Not only are they fun and hot in person, but they sound great. It’s a podcast that’s funny and charming with voices that are easy on the ears. And their home studio has better equipment than most radio stations! Thanks for letting me sit in! Check out their site and download their podcast. 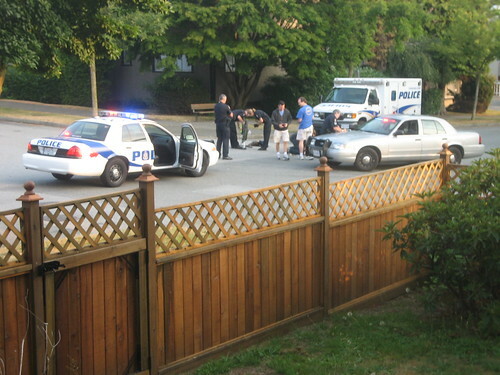 Kitsilano: Livin’ In Da Hood Yo.